We were very privileged to have Milena perform the 2nd movement of Gorecki’s Symphony No.3 with us in May 2015, and we hope to have her work with us again in the future. A wonderful soprano not to be missed! 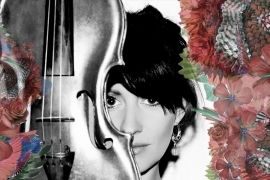 Anna performed with the Amici Orchestra in 2011, and again in May 2014. An amazing violinist who draws from a wide variety of influences in her playing, and an incredible stage presence. Parker Violins is the personal website of Colin Parker who specializes in bows rehairs of all instruments of the violin family, as well as offering violin, viola & cello repairs, valuations and sales by request. Bromley Youth Music Trust is one of the finest youth music organizations in the UK. Nearly half of the players of the Amici Orchestra went through the entire Bromley Youth Orchestra system, and either played in the multi-award winning Bromley Youth Chamber Orchestra or Bromley Youth Concert Band. They are always great supporters of the Amici Orchestra, providing logistical help and assistance. 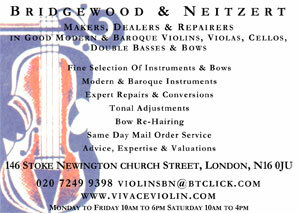 Bridgewood and Neitzert Ltd are violin dealers, repairers and makers, offering a fine selection of modern and baroque instruments. They have generously sponsored The Amici Orchestra on a number of occasions.